Before you can start with a second level analysis you are facing the problem that all your output from the first level analysis are still in their subject specific subject-space. Because of the huge differences in brain size and cortical structure, it is very important to transform the data of each subject from its individual subject-space into a common standardized reference-space. This process of transformation is what we call normalization and it consists of a rigid body transformation (translations and rotations) as well as of a affine transformation (zooms and shears). The most common template that subject data is normalized to is the MNI template. There are many different approaches to when to normalize your data (e.g. before smoothing your data in preprocessing or after the estimation of your contrasts at the end of your first level analysis). I prefer to do the normalization after the first level model was estimated, as I don’t want to introduce to many unnecessary transformations in the subject specific first level analysis. There are also many different softwares that you could use to normalize your data and there is a lot of debate of which ones are better and which ones are worse. There is a very good paper by Klein et al. (2009), called Evaluation of 14 nonlinear deformation algorithms applied to human brain MRI registration, that summarizes and compares the main approaches. According to this paper and from my own personal experience, I highly recommend to use ANTs to normalize your data. I also recommend to not use SPM8’s normalization module (to see why check out SPM12’s release notes, page 9, section “8.5. Old Normalise”). In contrary to SPM8, SPM12’s new normalization approach seems to do very good. This section will show you how to use Nipype to do a normalization with ANTs (what I recommend) or with SPM12. I highly recommend the normalization with ANTs as it is much more accurate. But I also want to point out that the computation of ANTs normalization is much longer than the one with SPM12, which also does a good enough job. Usually, we first normalize the subject specific anatomy to the template and then use the resulting transformation matrix to normalize the functional data (i.e. first level contrasts) to the template. But this also means that we assume that the functional and the anatomical data is laying on top of each other, or in other words, that they were coregistered to each other. The coregistration of the functional data to the anatomical data means multiple interpolation of your data. That’s why the coregistration and the normalization of your functional data should be done directly in one transformation. To account for both possible cases, the following script will show you both ways. The approach where both coregistration and normalization will be done in one step will be called complete transformation, and the approach where we only do a normalization will be called partial transformation. Partial does not mean that it doesn’t lead to a complete normalization of the data, it just means that the coregistration of the functional and structural data was already done in an earlier step. A big thanks to Julia Huntenburg! Without her help and knowledge about ANTs and Nipype this section wouldn’t exist, as she provided me with the relevant code and structure of this pipeline. But first, as always, we have to import necessary modules and tell the system where to find the FreeSurfer folder. Now we define the names of the folders used for this pipeline, we specify the list of subjects which should be normalized and specify which template the data should be normalized too. In this case it is the MNI152_T1_1mm_brain.nii.gz template. # Registration (good) - computes registration between subject's structural and MNI template. This registration node antsreg might take a while, depending on the power of your system. One way to speed up this process is by using multiple cores/threads for the calculation. For example, use 4 cores for the calculation by setting the parameter num_threads to 4. 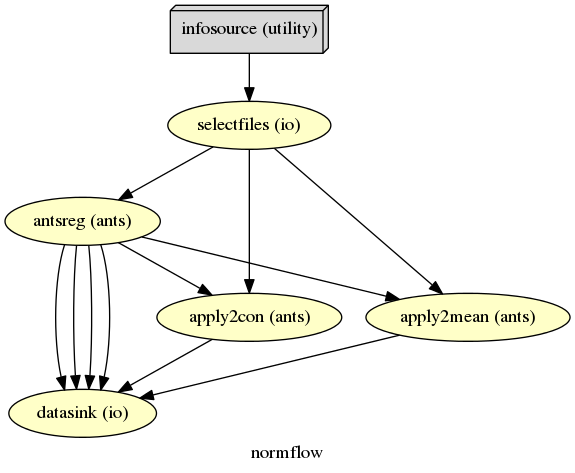 But be aware, that if you run the normalization pipeline for 10 subjects in parallel, the code will try to launch 10 instances of ANTs registration with each asking for 4 cores. # Registration (fast) - computes registration between subject's structural and MNI template. Now that we have the transformation matrix to normalize the functional data to the template, we can use ANTs’ ApplyTransforms to execute that. Note: Here you have again the option to specify the number of threads used in the interpolation of the data. In the partial transformation approach, we only need the following additional nodes. One to normalize the anatomical and one to normalize the functional data. For the complete transformation, we also need to calculate the coregistration matrix (we will use FreeSurfer’s BBRegister for that). But first, we need to use FreeSurfer’s FreeSurferSource to grab the subject specific anatomy, convert it from MGZ to NII format with MRIConvert. Than we need to transform the BBRegister transformation matrix to ITK format with C3dAffineTool and merge this transformation matrix with the transformation matrix from the normalization, i.e. antsreg, by using a Merge node. Before you can use the C3dAffineTool you have to make sure that you have the C3D routines on your system. Otherwise you get the following error: IOError: c3d_affine_tool could not be found on host. To download the newest C3D version, go to this homepage. Afterwards, unpack and install the code on your system, this can be done with the following command: sudo tar xzvf ~/Downloads/c3d-nightly-Linux-x86_64.tar.gz -C /usr/local/.. And finally, to make sure that your system finds the binaries of this software, add the following line to your .bashrc file: export PATH=/usr/local/c3d-1.0.0-Linux-x86_64/bin:$PATH. A very important difference between the partial and the complete approach is that the parameter invert_transform_flags of the ApplyTransforms has two values in the case where we have two transformation matrices and only one value where we have only one transformation. If this is not accounted for than you get the following error: ERROR: The useInverse list must have the same number of entries as the transformsFileName list. The normalization of your data with SPM12 is much simpler than the one with ANTs. 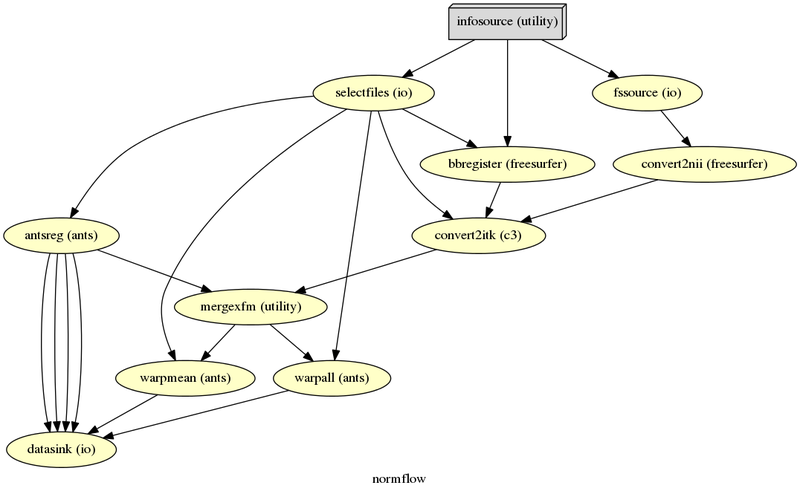 We only need to feed all the necessary inputs to a node called Normalize12. As always, let’s import necessary modules and tell the system where to find MATLAB. It’s important to note that SPM12 provides its own template TMP.nii to which the data will be normalized to. The functional and anatomical data that we want to normalize is in compressed ZIP format, which SPM12 can’t handle. 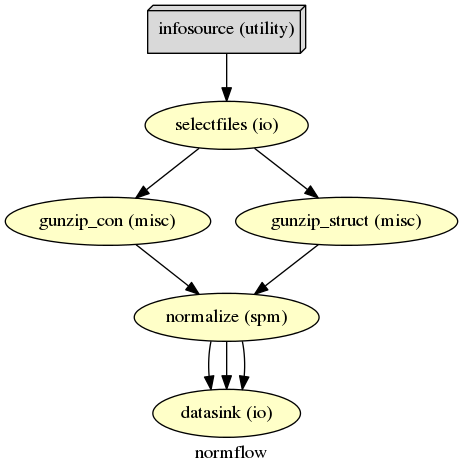 Therefore we first have to unzip those files with Gunzip, before we can feed those files to SPM’s Normalize12 node.